IIMs are known to encourage gender diversity and IIM-T is no exception. But let not this statement make you think that this is just another article on gender diversity – this is the tale about a working mother in the hallowed galleries of an IIM. I take immense pleasure in introducing Sneha More, who is an MBA student at IIM Trichy. She holds a Bachelors of Technology degree in Production Engineering from College of Engineering, Pune. She has 3 years of prior work experience as a QA in Dassault Systems. Number crunching is her passion. One can discuss for hours about the updates in various industries with her. Q: What motivated you to join MBA College even after having a child? I had an inclination towards management studies from earlier times in my job and got final conversion call from one of the IIMs in 2015, but at that point of time I had some personal commitments to fulfil, so I didn’t join the institute. When I joined back Dassault Systems after maternity leave, the surrounding was really welcoming. Everyone was doing something great in quite diverse fields and I used to get involved in the discussion through which I found the motivation to not to forget my dream. Though I am a mother now, if I don’t pursue my dream then what example am I going to set for my kid? This thought kept crossing my mind frequently and thanks to my supporting family, I decided to attempt CAT once again. Q: How did you manage your time to prepare for one of the toughest MBA entrance exams? This was the most challenging part. I had to steal time bit by bit to study. Kuber, my son, was around a year old. I had to come back from my office to home to nurse him by travelling 20 km a day to and fro. I used to study when my colleagues used to take a break in the office. I joined a coaching institute to study in weekdays in the early morning slot so that I can give my time to my son during the weekends. Q: What resistance or support did you face from family, friends etc.? My husband and the rest of the family supported my decision and always pushed me forward. My colleagues helped me in different ways. Some used to help me directly by getting indulged in the academic discussions with me and some used reverse psychology to prompt me towards my goal. My mother took charge and used to take care of Kuber, while I used to study. Yes, sometimes I encountered depressing moments when I scored lower than my expectation with the sacrosanct chaos in the life, but my one-year-old son somehow used to figure it out and his cute little hug used to be more than enough to rejuvenate me in those moments. Q: Did you feel anything odd (if any) in the batch of about 23-25-year-old singles? How much support did you receive from your batch? Ohh, they are my family now. We reciprocate so much love and care, even they named me as Choti Kuber. 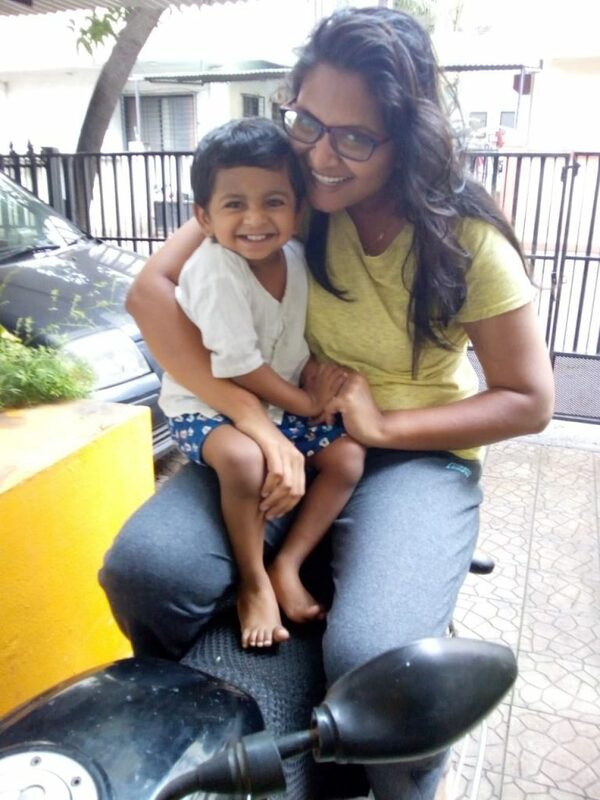 People get awestruck first after knowing the fact that I am a mother, ask me about my kid and then they share their thoughts of feeling motivated by looking at my journey so far to IIM-T. There is no odd feeling instead, I get along with them so easily. We are always there for each other and some of my friends are indeed the saviours to shower their knowledge at the last minute before the exam. Q: How is your journey so far in IIM-T? It’s been full of new experiences for which the IIMs are rightfully famous. I have learnt to complete the tasks while maintaining the quality and time constraints irrespective of the prior knowledge of it. Setting priority is really important here. The rigour taught me to manage my time judiciously. I found a family here in my peers along with extremely supportive faculty members and seniors who are making my college life smoother. Q: How do you balance your study in IIM-T and family given the fact that IIMs are known for their extremely rigorous MBA course, perhaps the most rigorous of them all? I agree with the rigour part, but it all depends on the individual that how he or she tackles it. Sometimes I find myself in a pressing situation but thanks to the technology, I connect to the family after classes over a video call, which is the sole radix of my survival here. My happiness lies in them and I have to set time for my kid according to his convenience, then I get back to my tightly occupied life here. Q: How do you strategize to seek the value addition to your profile from IIM-T? I am a Marketing and Analytics enthusiast. I participate in almost all the competitions to hone my skills while aligning those with my love for number and statistics. I try to extract the most out of my time here by indulging myself in the activities which go on around me. In my spare time (whenever I manage to find some), I explore different company data and markets to expand my horizon of knowledge and satiate my curiosity. Q: Any suggestion to the prospective students, especially married women, who would like to pursue the fabled and terribly rigorous 2 year MBA course from IIMs? I am not an expert in giving life advice to others, but most importantly, women should not forget their identity after having kids. Guilt feeling in mother is high because of her affection for the child. But she should think in another way to set an example for her child, family and the entire society. A mother takes diurnal decisions in the family and if she is strong and independent then the same traits would get imbibed in her kids. So, chase your dream whatever it is and put your honest efforts in order to achieve that. Knowing you since last 12-13 years, I have seen your undulating journey through out. It is an emense proud moment to see you courageously fighting your way out from every hurdle. I couldn’t be more happier for you.